This room was super traditional. The photo on the left is from the real estate listing when the former owners lived here. 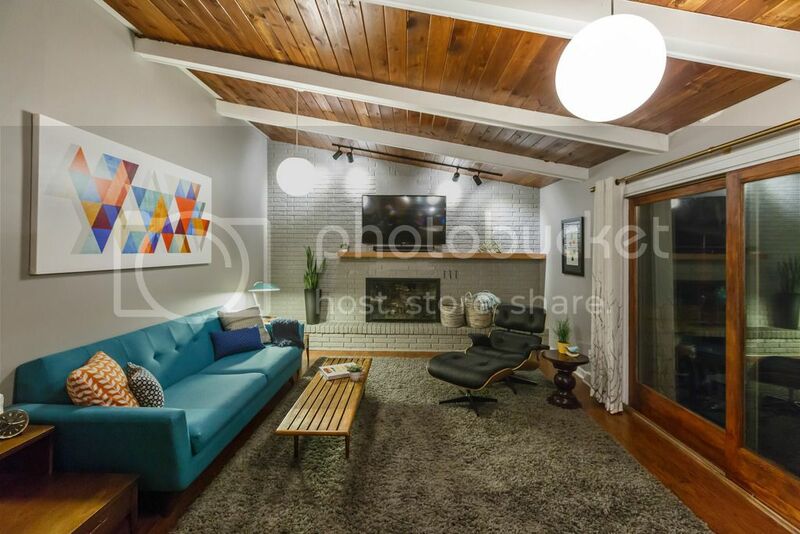 Overstuffed sectional sofa, bookshelves chuck full, TV in the corner. SO.MUCH.STUFF. The photo on the right is when I started working with these clients. They sit in this room a lot, and have small children, so while they wanted a makeover, they also needed it work for their family & casual lifestyle. I started with a neutral sofa in a dark gray fabric (kid & dog friendly! ), which reads visually heavy. I added in a pair of light & airy chartreuse chairs. I worked in some wood with simple side tables and a coffee table that doubles as an ottoman. I added some colorful accessories with artwork & pillows, and there you have it, a midcentury modern makeover mixing new (Joybird sofa & Hip Haven bullet planter), vintage (side chairs, side tables), classic (Arc lamp), and midcentury-inspired (artwork from a favorite Etsy seller, Thedor). So where did we end up? We ended up with my favorite family room makeover to-date. After getting their Joybird fabric samples, they wanted to go bolder with their Hughes sofa. If you know me, you know I'm a HUGE fan of bold color. This sofa is perfection in their family room and I LOVE that they decided on this gorgeous blue. They also decided to move their classic black Eames lounge chair & ottoman from their formal living room into here because it wasn't getting much use in there. It's obviously a classic midcentury piece and fits in perfectly. We skipped the Arc lamp because they decided to added classic globe lamps to the ceiling. There wasn't much lighting in here, so it made sense to add more. They look original to the house and they are one of my favorite additions. Besides adding the tongue & groove to the ceiling, which adds so much warmth to the space, the biggest change was taking down those traditional (and not original...) built-in bookcases on either side of the fireplace. Talk about simplifying the space! While I love original built-ins for storage, I prefer a much cleaner look. I know people go wild for styled shelving, but to me, it's too busy, too much to dust, too much to keep styled in real life. I LOVE that we are now seeing the original brick fireplace. I LOVE the simple, asymmetrical floating mantle we added to hide their TV cords and display a couple of plants. The Thedor prints are here, but were too wimpy over the sofa. The clients sourced this AMAZING piece from The Modern Art Shop on Etsy and it's perfect on this oversized wall. Aletha, What a fantastic transformation! The best part is I couldn't tell from the afters exactly what was done except that the room looked like it should have looked in the befores but didn't!!! That is an incredible compliment. You did a wonderful job of paying homage to the character of the home yet making it utterly timeless. Kudos.